That photo looks like so many out of my childhood…Not the dress (!) but the woman could be my aunt, same glasses, coat everything! What a happy girl…smile on her face, doll in her hand. Life is good! What a happy child! My WW is up, stop on by. Look at that big ole smile!!!! Great pic! OH my goodness, that is precious! That is an awesome picture. The big smile on the girls face is priceless. I love old family photos. Thanks for sharing and thanks for visiting! Christmas from long ago! What a doll holding the doll! Great share for WW. Happy Wednesday! Mine is up! Wow, I love antique photos! This is one to be cherished! The expression on the little girl’s face is just priceless! 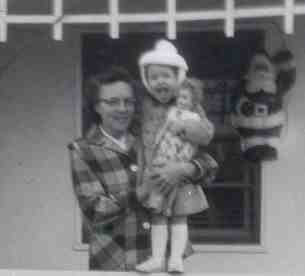 faerie rebecca: That’s me with my mother at Christmastime in 1958. I am holding my Lucy doll. (She and I were inseparable and yes, I still have her.) That was taken on the porch of a house we rented while our home (the one I live in now) was being built. My mouth was wide open, as you can see, which my sister always says was a) typical and b) a prediction of my eventual profession (lawyer). The light-up Santa hanging on the front of the house went up every single year — well into the 1980’s — until it disintegrated. LOL I love your comment about the photo. Happy New Year, and thank you for stopping by my blog. What a great shot — I love photos like this. Great memories. I was just reading your profile. How impressive. It’s National Oatmeal Month – have you had your oatmeal today? Love old photos – someone sure was happy, is that you? You look so pleased with Lucy! I’ve got just a couple of Christmas pictures of me when I was around that age. Both mine and yours look to be equally “antique” lol. I was born in ’58 and I swear that doll you’re holding looks very familiar lol! love that pic and the post below it..
Great photo!! I love the fiesty look you have on your face! Happy WW! I love the fact that you live in your childhood home and still have the doll. I have many artifacts from my past as well. Well, doesn’t this beat all . . . I never heard of Lodi until two gals came down from there to work with me at a school for the deaf in Mexico. From what I understand it is a SMALL community. Nice to meet you, and if you know Ann and/or Katie say ‘Hi’ for me. Thanks for stopping by my place today. I’m looking forward to checking out more of your blog.